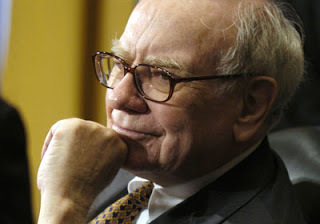 The Urban Politico: Warren Buffett v. Republicans onTaxing the So-Called "Job Creators"
What Buffett is talking about here is the difference between income tax (which is what most of us know about) and capital gains tax (which is what rich people know about). If you have a job, then you are quite familiar with that cat named FICA and how much income tax he takes out of your check every pay period. Depending on how much you make in a year, your income tax percentage can range from 10% all the way up to 35%. Again, this is for those of us who have jobs, but as we all know from Rich Dad, Poor Dad, rich people don't have "jobs." They don't work for somebody else at some 9 to 5, so they don't have to worry about income tax because they don't have "income." They earn their millions from "capital gains." I have worked with investors for 60 years and I have yet to see anyone — not even when capital gains rates were 39.9 percent in 1976-77 — shy away from a sensible investment because of the tax rate on the potential gain. People invest to make money, and potential taxes have never scared them off. And to those who argue that higher rates hurt job creation, I would note that a net of nearly 40 million jobs were added between 1980 and 2000. You know what’s happened since then: lower tax rates and far lower job creation. “For tax raising advocates like Warren Buffett, I am sure Treasury would take a voluntary payment for deficit reduction,” Sen. John Cornyn (R-Texas) wrote in a tweet. “If Warren Buffet wants to pay more taxes and send more of his money to Washington, why doesn't he just do it?” tweeted Brad Dayspring, a spokesman for House Majority Leader Rep. Eric Cantor (R-Va.), who has led the push against tax increases to help reduce budget deficits over the next 10 years. Focusing on the super-rich also fosters a counterproductive attitude toward material success. The way to promote a hard-working, entrepreneurial and innovative society is to celebrate great wealth so long as it has been earned by legitimate means. When this is not the case, policy should target the wrongdoing directly, not demonize everyone who hits it big. 1. By your view, are the rich currently paying their fair share? 2. Does lowering taxes on the rich actually create jobs? 3. Should we have a "Flat" tax rate across the board which is the same % for everybody? 4. Is it fair to ask the rich to pay MORE than everybody else? 5. Are we punishing the rich for their success by focusing on their tax bracket?